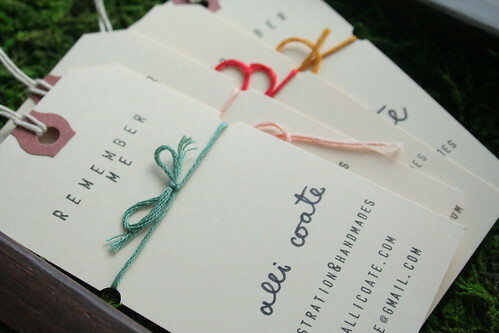 When I sat down to design my new business card, I knew I wanted something that incorporated handmade elements and something textile-related. After a slightly agonizing brainstorming session (I wish I could say that this idea came effortlessly!) 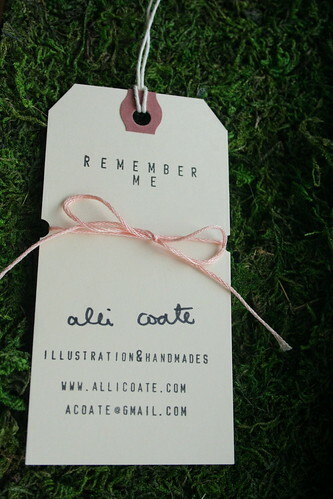 I thought of the string tying reminder and how appropriate that was for a business card. So this is what I came up with. After hundreds of punches, stamps, signatures, and bows I was so pleased that they were well received at the sale. The only thing I regret is not incorporating an image of my work somehow... I'll have to start thinking up a new version!